Fredrick's masterful piano style, replete with youthful-yet seasoned chords, has been enthusiastically enjoyed by audiences ranging from elementary school to heads of state. He is well versed in a variety of modern jazz styles which includes New Orleans Trad, New Orleans Brass Band, swing, Bop, and Avant-garde. He began studying classical cello at the age of 10. He excelled at cello, winning awards for outstanding performances. Sanders received his early jazz education at Arts Magnet High School for the Performing and Visual Arts in Dallas, TX. Sanders was recognized as Downbeat Outstanding Instrumentalist for Cello and was named High School arranger of the year for his arrangement of Dan Haerle's "Crib Chimp". After high school, Fredrick's desire to enhance his musicianship kept him busy. Sanders found time to serve as sideman for jazz greats such as Clark Terry, David "Fathead" Newman and Texas tenor James Clay. He was chosen to open for pianist Shirley Horn at the Caravan of Dreams in Fort Worth, TX. In 1992 Fredrick was afforded the opportunity to study with avant-garde jazz legend Alvin Batiste and pianist/conductor Frank White at Southern University in Baton Rouge, LA. Sanders' skill and execution on piano won him a position in a group of musicians that accompanied Alvin Batiste at the De Oosterport Groninga New Music festival in Amsterdam and appear on Alvin Batiste CD entitled "Late." In 1994, his music and academic pursuits took him to Southwest Texas State University. While there, Sanders performed with a Downbeat Award winning combo that was featured at the Montreaux and North Sea Jazz Festival. Sanders performed at several national and international jazz festivals and appearing with such artist as Erykah Badu, Frank Foster, David Newman and Roy Hargrove. The release of Fredrick's 1997 debut CD entitled "East of Vilbig" on Leaning House Records received rave reviews from periodicals such as Austin Chronicles, The Jazz Attic, The Dallas Morning News and Dallas Observer. He was featured in Jazztimes and appeared on "BET" on Jazz. This recording reunited Fredrick with his high school friend Roy Hargrove, who is also joined by Texas Tenor Marchel Ivery, guitarist Mark Whitfield, bassist Roland Guerin and drummer Donald Edwards. He has given performances at Chopin Conservatory of Music in Warsaw, Poland, Den Haag Netherlands, and Ontario Canada. Touring Japan, Europe and our great country has allowed him to teach and learn from the most prominent thinkers and institutions of higher learning in the world. In recent years Fredrick Sanders has been commissioned by Wynton Marsalis to accompany and record with the Lincoln Center Jazz Orchestra on piano. He has also recorded with notable artist such as Nora Jones, Benny Golson, and Dr. John. In 2003 Fredrick Sanders released his greatly awaited sophomore recording entitled "Soul Trinity vol.1" featuring bassist Rodney Whitaker and drummer Troy Davis. The CD was featured at the New Orleans Jazz and Heritage Festival. Fredrick Sanders and his wife vocalist Sheila Sanders performed for the PBS special "Journey Back To Gospel" hosted by New Orleans vocalist Kim Prevost featuring Jimmy Smith, Zion Harmonizers, Wess "Warm Daddy" Anderson, and Leah Chase. Fredrick Sanders continues to maintain a busy schedule as a cellist and pianist lending his abilities to several recordings, performances, and compositions. Fredrick Sanders earned his Associate in Arts degree from Weatherford College in Weatherford, Tx. and Bachelors of Music from Texas State University in San Marcos, Tx. 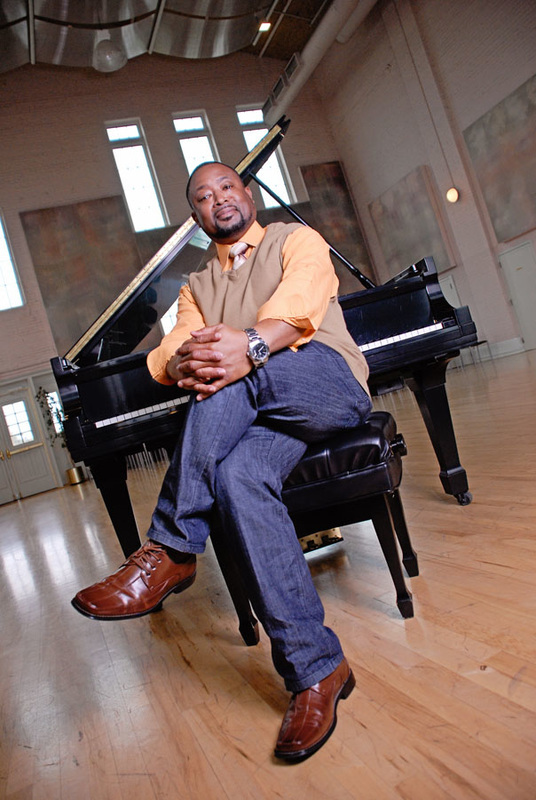 For over two decades he has been nationally and internationally recognized for his accomplishments as a performer, composer, arranger and educator. In the fall of 2004 Fredrick became the Jazz Piano instructor at Delgado College in New Orleans, La. In 2005 along with teaching at Delgado College, Fredrick accepted the position as Jazz Piano Instructor at Tulane University in New Orleans, LA. Fredrick Sanders has served eight years as the Music Director for Church of The King in Mandeville, LA. while working globally on stage, in film, as well as television. He was featured in the November 2011 issue of Southwestern Baptist Theological Seminary Campus News, May 2012 issue of Southwestern Musician Magazine and Worshipper Magazine. Fredrick is currently the Commercial Music professor at Cedar Valley College in Dallas, TX. the instructor of jazz piano at Southwestern Baptist Theological Seminary, and piano instructor for Keys4Kids through the Dallas Jazz Piano Society. ​as Head of Jazz Studies.